India – CB Capital Research, Inc. 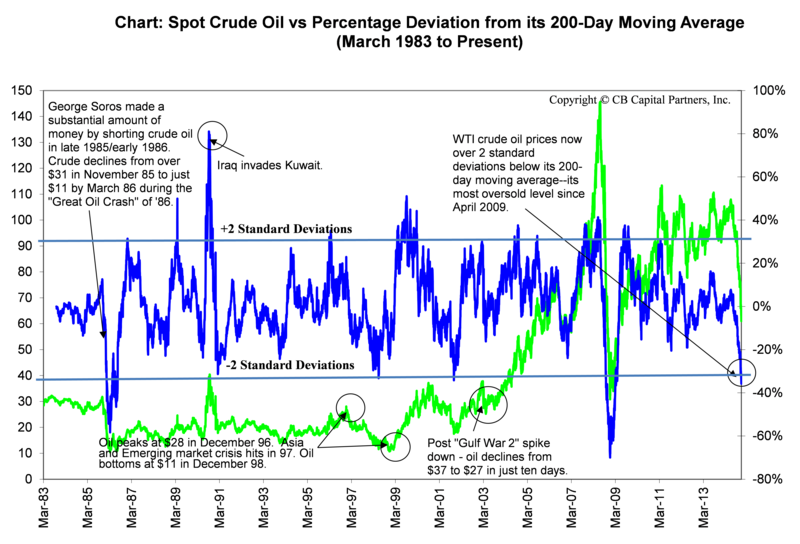 The commodities complex is hugely oversold. US$ bullishness has not been this high since the depths of the financial crisis in early 2009. With the SNB eliminating the synthetic peg to the Euro–Euro bullishness will be revived over the next couple of weeks, as the 41% intraday decline of the Euro against the Swiss franc likely resulted in the short-term capitulation of all remaining Euro bulls. 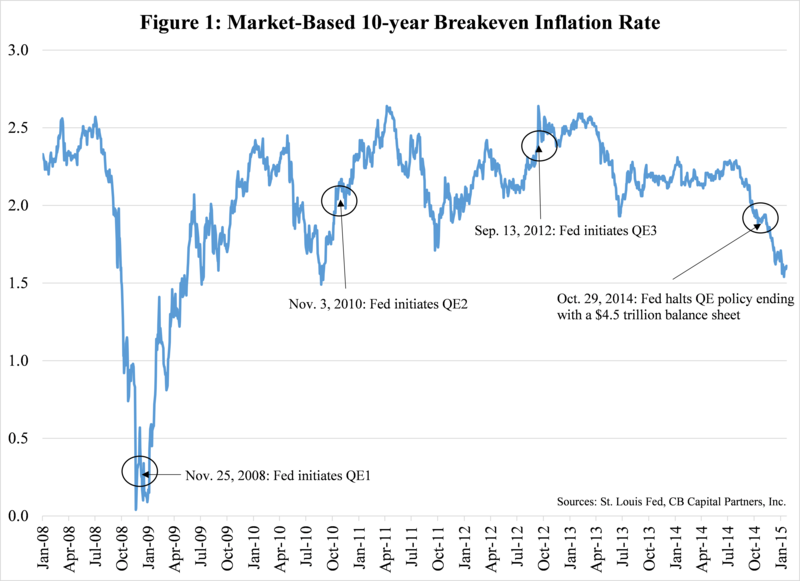 My sense is that the Euro will actually rise if the ECB chooses to adopt QE on January 22nd, as QE would mean the ECB will unconditionally try to keep the European Monetary Union together, which will be bullish for euro-denominated assets, as well as for assets leveraged to the global economy, such as commodities. We also believe the latest 25 basis point easing by the Reserve Bank of India will be first of many rate cuts this year; China will also follow. With India now the world’s third largest oil importer, any economic acceleration in India will also be felt in the commodities complex. As such, I believe the commodities space (oil, copper, silver, etc.) will rally hard over the next 2-3 weeks at the very least. In our October 28, 2013 commentary (“An Early 21st Century Narrative: The Age of Renewables“), we asserted that–due to increasing domestic crude oil production and the ongoing adoption of renewable fuels–U.S. energy independence on a national level is a foregone conclusion. The Energy Information Administration (EIA) chronicles that last year, as much as 84% of total U.S. energy demand was fulfilled by domestic sources, the highest level in 30 years. Interestingly, 10% of our domestic energy production now comes from renewables (including hydro, solar, wind, biofuels, and thermal). We believe government agencies in general are too pessimistic regarding the trajectory of the increasing impact of renewables on U.S. and Developed Markets’ energy production. For example, Germany (a country not known for its sunshine) recently generated over half of its electricity from solar for the first time, while Great Britain’s installed solar capacity doubled over the last year–none of which anyone has foreseen. Because of the rapid adoption of renewables, as well as the ongoing shale revolution, we continue to believe that U.S. energy independence on the national level is a foregone conclusion. What we are more interested in–as investors and global citizens–are two more ambitious goals: 1) energy independence at the community or household level through microgrids and a “smart,” decentralized distribution system, and 2) bringing electricity and heating to more undeveloped areas of the world. The International Energy Agency (IEA) estimates that 1.3 billion people today are still without access to electricity, while 2.6 billion people have no access to clean cooking facilities. This is a glaring social problem not just in Sub-Saharan Africa but in other developing countries/regions, such as India, China, and Developing Asia. e.g. The IEA contends that as much as 25% of India’s population today have no access to electricity. A country where a vast segment of its population is disenfranchised is both a significant impediment for future economic growth and social harmony. The role of public policy makers in shaping global energy policy has been on the rise, and will continue to rise for the foreseeable future as governments set goals for renewables adoption (e.g. California’s 33% renewables goal by 2020) and new efficiency standards. Within the developed world, these two trends are driven by environmental and domestic energy security concerns. 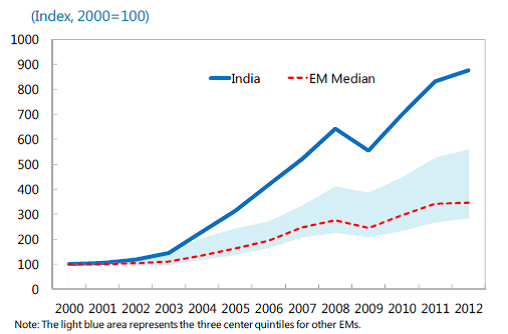 Within Emerging Markets, however, these are driven by more fundamental concerns. For example, economic growth and the rising cost of energy has led to a significant deterioration of China’s and India’s trade accounts in recent years. The rising cost of energy (combined with significant gold imports) was instrumental in causing India’s financial crisis last summer. 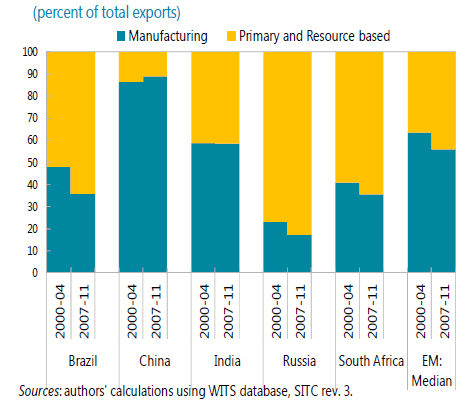 Since 2011 (the IEA’s last study on Emerging Markets’ energy imports), energy dependence in countries like China and India has continued to rise. 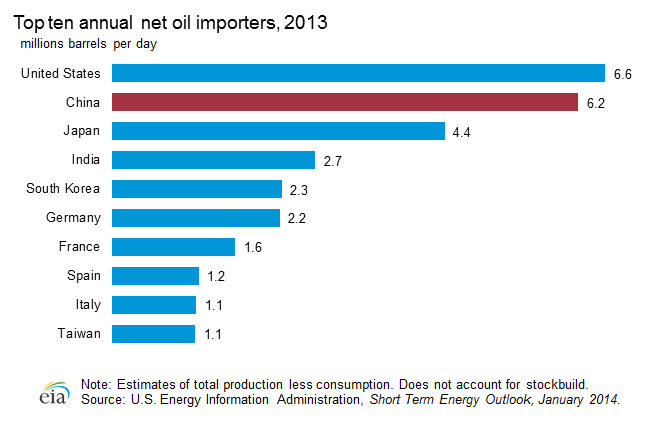 In fact, China’s oil imports are projected to rise above that of the U.S. sometime this year. As such, investments in renewables in both China and India are not only necessary due to environmental concerns, but national security concerns as well. Finally, as discussed above, there is also a dire need to empower those who currently have no access to electricity in many developing countries, including India. This is crucial to sustain high economic/productivity growth, as well as for long-term social cohesion (having electricity inherently increases access to education, knowledge, and healthier lifestyles). The IEA estimates that an additional $641 billion in investments is needed to achieve universal access to electricity by 2030, $135 billion of which is needed in India. In light of the $40.2 trillion of projected investments in the global energy sector over the next 20 years, $641 billion is achievable. However, the IEA also stresses that much of these investments would need to be made in rural areas with little or no access to any existing infrastructures (e.g. power lines or even paved roads). Since the costs of building a centralized grid (or expanding the current grid) to rural areas are prohibitively high, the only alternative is to install microgrids or roof-top solar in such undeveloped rural areas. The age of renewables will thus not only bring U.S. energy independence, but increased energy access to the rest of the world as well. Last Wednesday, the World Bank declared China would overtake the U.S. as the world’s biggest economy on a PPP basis by the end of this year. The practice of utilizing PPP in comparing economic output across countries has become less useful as global trade and cross-border asset flows continues to grow as a percentage of the global economy. Yes, your US$ still gets you further in China than in the U.S. on average; and the median Chinese urban household still earns less than 20% of the median U.S. (both urban & non-urban) household. But this ignores the fact China is the world’s biggest importer of commodities such as copper, iron ore and precious metals–all of which are settled at world market prices which PPP has no bearing upon. Chinese economic output measured at PPP also ignores the fact that real estate prices in Tier-1 cities such as Beijing and Shanghai are now on par with those in New York and Los Angeles. Seen in this light, a Yuan actually goes further in a major U.S. city such as Houston or Dallas than in Shanghai or Beijing. Since Americans are generally much more mobile than the Chinese (which in theory allows a U.S. family to resettle to lower cost-of-living areas), a comparison between U.S. and Chinese economic output using PPP is highly misleading. That is not to say it isn’t a worthwhile exercise. At the very least, the World Bank study has again put the Chinese economy, leadership, and corporations in the spotlight as the “Central Kingdom” re-asserts herself, first in the global economy, and second, in global geopolitics. 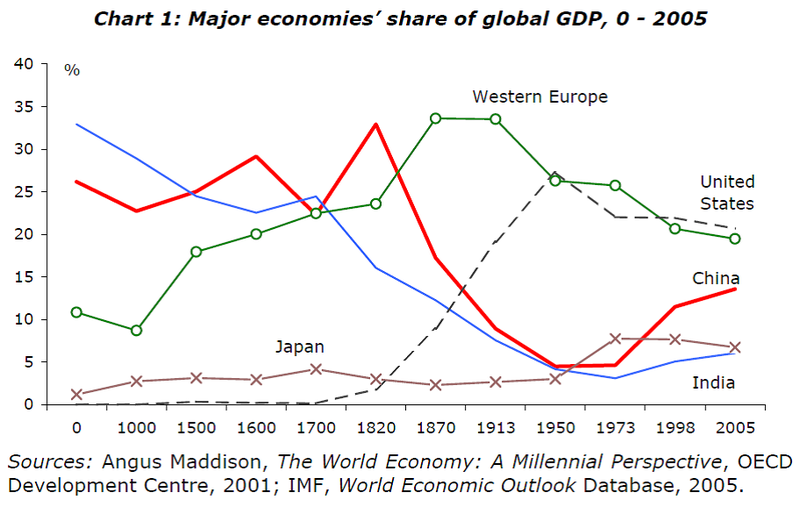 Work done by the late British economist Angus Maddison suggests China’s share of global GDP was over 30% as recent as 1820. At their respective peaks, total economic output of China and India together made up approximately half of global GDP during most of the last two thousand years, with the exception of the last 200 years. As students of Asian history, the above chart comports with our understanding of the history of the Chinese dynastic system, and its subsequent decline (note that pre-1368 A.D. data–i.e. pre-Ming Dynasty–is almost non-existent, e.g. the invasion of the Mongols and its impact on China during the early 1200s does not register in the above chart). The relative decline of China’s influence as the Ming Dynasty retreated from global trade–along with a costly war with Hideyoshi-led Japan–could be seen in the above chart. The decline in Chinese relative influence accelerated in the early 1600s as the Ming Dynasty weakened, with the dynasty eventually falling due to corruption, inept management, bad harvests, and the Manchu invasion during the early to mid-1600s. Under the Manchu-led Qing Dynasty, however, the Middle Kingdom regained her former glory. The Qianlong Emperor (who ruled for 60 years and interestingly, would die in 1799–the same year that President George Washington died) ruled an empire unprecedented in size–encompassing both Mongolia and Tibet. By 1790, the population of the Qing Empire soared to over 300 million, or just under the U.S. population today. 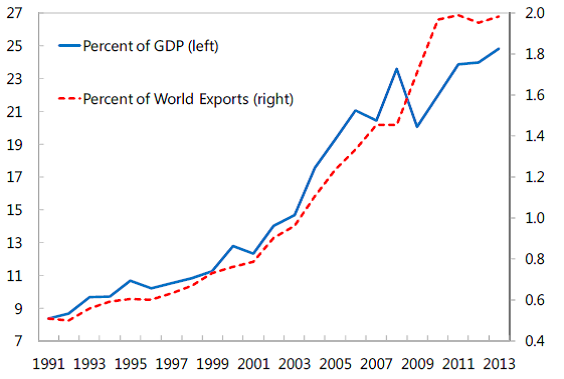 Chinese relative economic output would peak soon afterwards at nearly 35% of global GDP. According to Professor Maddison and Professor Dwight Perkins of the Harvard Kennedy School, what was most impressive about China during most of her history was not its sheer population growth; nor the size of her empire. What was most impressive about the Chinese economy was her successful response to population growth–i.e. her ability to sustain per capita consumption over time even as population grew. The Chinese drove productivity growth in agriculture through increased use of fertilizers, irrigation, development of crop varieties, as well as published and distributed agricultural handbooks to spread “best practices” in farming. New crops from the Americas–which could be grown on inferior lands–were also introduced. In other words, China has a rich history of innovation, adaptation, and engaging herself with the rest of the world. By the early 19th century, however, China’s 2,000 year-old dynastic system was no longer a suitable governing system for a fast-changing, industrializing world. As innovation and change swept the world, the Chinese ruling class hung on to outdated concepts and actively discouraged reforms–including the emphasis of science/math over the “classics” in the Imperial Examination. The rigidity of China’s ruling class and system during the 19th century made her vulnerable to foreign influence and invasion. The subsequent experimentation with Communist ideology in the early 20th century would prove disastrous. All in all, it took over 150 years for China to recover and to be recognized as a global economic power once again. The latest World Bank study is thus timely, as both China and the rest of the world need to begin addressing the consequences of China rising to become the world’s #1 economy. Consensus suggests China will surpass the U.S. in nominal GDP by 2019 (as recent as 2003, Goldman Sachs believed China won’t surpass the U.S. until 2041). e.g. Chinese battery maker BYD experienced significant growing pains due to the company’s inexperience when it opened its North American HQ in Los Angeles. As Chinese influence continues to grow around the world, there will be inevitable clashes over business practices, cultural misunderstandings, and increased competition (including those for real estate and college applications). As an investment bank who actively engage in U.S.-Chinese cross-border transactions, CB Capital has had first-hand experience in working with Chinese companies and cultures. We are also engaging with other U.S.-Chinese cross-border groups to cultivate closer relationships between local U.S. and Chinese/Hong Kong companies. Sure, China is experiencing growth challenges, but this is to be expected. In particular, we are watching three issues very closely. As we have discussed, the Chinese “demographic dividend” is over. We expect Chinese real GDP growth to be in the range of 5%-8% over the next several years. China’s population growth has sunk to just 0.47%, ranking 159th in the world. By 2020, the Chinese demographic pyramid will be more inverted than that of the U.S. Another challenge is China’s unprecedented credit growth over the last five years, which was fueled by the country’s well-intended but poorly-executed US$586 billion fiscal stimulus package in 2008-09. A final challenge–which comes with the territory of being potentially the world’s #1 economy–is China’s dependence on foreign energy imports. China as we speak is making slow but steady progress on shale gas, but the country’s oil consumption growth remains unabated. In fact, the Energy Information Administration (EIA) expects Chinese oil imports to surpass those of the U.S. sometime this year. Energy security will thus become an increasing concern for China over the next several years.